Ok so my feet aren't webbed but I did start my swim lessons this weekend. I was a little stir crazy after being stuck in the house because of the bad weather. We are expecting more snow but no where near as bad as it was, hoping desperately, so I had to get out and about while I could. And I have to say I hit the gym three days in a row and then had swim lessons yesterday. I got cute swim suits (vintage swim dress and adorable shortini--yes they make up all kinds of words now) from SwimSuitsForAll.Com and then had to run around and find a swim cap because while I trusted that the conditioner would help guard my hair from the chlorine I didn't want it to have to work too hard. I found one and headed out to the class terrified of the water like normal. I have to say though it wasn't so bad. Remembering how to be underwater without freaking out as good. Need to work on being comfortable on my back but all in all was a treat. With that hour in the pool I hit four workouts for the week and 5 for the year so far. That's almost a tenth of my total for all of last year. And the workouts are getting longer too. I've been hovering in the 35 to 45 minute range but all of my gym stops this year have been at least an hour. I only stopped on Friday night because I wasn't sure how much we would do in swim class the next day and didn't want my legs to be jelly. BUT the upside of going often and staying longer is one or two of the workers/trainers keeps checking on how I'm doing and correcting my form when thy need to so the workout is more effective. So of course after the pool I wanted to do my hair. See the key word there is wanted. I started a prepoo and put my plastic cap on under my satin bonnet and promptly fell asleep after I ate lunch. I woke up three hours later and then I cooked dinner lol. I was slightly tired and then proceeded to do nothing and went back to bed a few hours later. I did wake up first thing this morning and washed my hair though. I detangled with my mini rake before I washed though since I was sure between the overnight prepoo and pool time my hair was going to be a tangled mess and I was kinda wrong. Very little hair loss there and after the wash itself. I opted for a flexi set again today but really do need to work on something else. Any good youtube videos for vintage styles ladies? 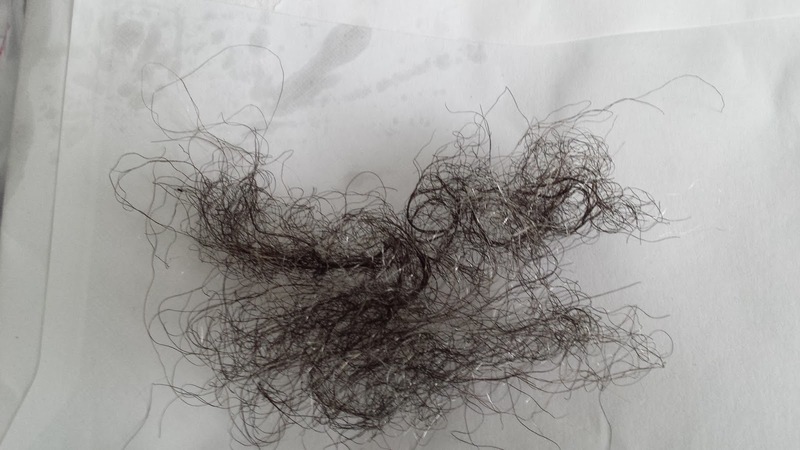 Here's a photo of the total hair loss for the day. I chuckled when I saw it because there was so much gray hair in it lol. Oh well such is life. Back to washing clothes an watching the game.